Offering you a complete choice of products which include Dish and Pot Washing Racks such as SS Bain Marie Counter With Hot Case, SS Pot Storage Rack, SS Dish Storage Rack. 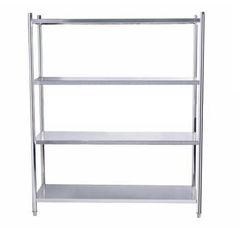 We offer a wide range of very high-quality Stainless Steel Storage Rack to our most reliable customers. These racks are offered with stainless steel inner pipe frame and legs structure with nylon adjustable bullet feet. We offer these products with high-quality rack shelves for storage with 2" outer bend for fall support for dish storage. These products are highly Eco-friendly in nature and highly appreciated in various industries for its compact design and superior quality. 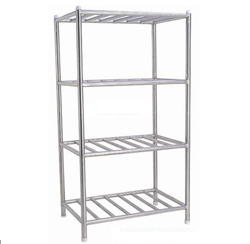 We offer a wide range of very high-quality Stainless Steel Pot Storage Rack to our most trusted customers. These products are manufactured from very high-quality stainless steel that is sourced from very reliable vendors. These products are offered with very high-quality stainless steel Inner pipe frame and legs structure with Nylon adjustable bullet feet. These products are available in various sizes correspondence to their average weights. These products can also be customized according to the requirements of our customers. Looking for Storage Racks ?